HABIT: Long clusters of fragrant flowers, mostly in July and August. Many colors. Arching, open branching woody growth, unusually thinly foliated. Blooms in spring on second year's growth. Prune after flowers have faded. 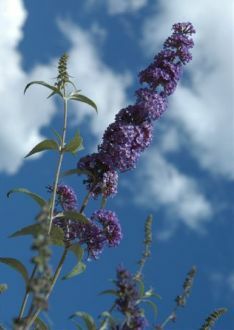 Buddleia alternifolia and Buddleia davidii have lilac flowers. The native Buddleia marrubiifolia has orange flowers. Cultivars available in several colors. CULTURE: Drought tolerant. Easy to grow in well prepared beds. USES: Summer color attracts butterflies, bees and hummingbirds. Borders, perennial garden. PROBLEMS: Can suffer freeze damage.